Happy birthday Judy Blume (Are you there God? It's Me, Margaret), Ann Atwood (Haiku: The Mood of Earth), David Small (Imogene's Antlers, Stitches), Chris Conover (The Christmas Bears) and Jacqueline Woodson (Show Way). It’s the birth date of U.S. President Abraham Lincoln (1809–1865). Read Lincoln Shot: A President’s Life Remembered by Barry Denenberg, illustrated by Christopher Bing. Happy birthday Georgia, the 13th of 13 colonies, founded 1733. Illustrator Randolph Caldecott (1846–1886) died on this day. The prestigious Caldecott Medal awarded annually to the most distinguished U.S. children’s picture book, was named in his honor. Random Acts of Kindness Week begins today. Read Kindess is Cooler, Mrs. Ruler by Margery Cuyler, illustrated by Sachiko Yoshikawa. Today is the birthday of Charles Darwin. He has the distinction of being not only one of the most controversial figures of his era but also someone who still causes discord two hundred years later. Or more accurately, his theories have been controversial—often obscuring Darwin the human being. Around Darwin’s 200th birthday some excellent books began to appear for children and middle school readers, such as Peter Sis’s Tree of Life and Alice B. McGenty’s Darwin. 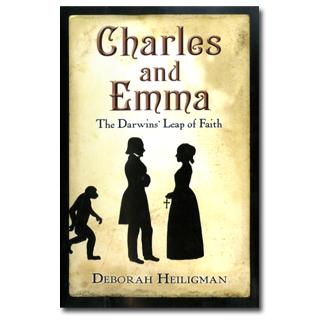 But certainly the most original book about Darwin for young readers appeared in 2009: Deborah Heiligman’s Charles and Emma: The Darwins’ Leap of Faith. Even the cover—a silhouette of a woman holding a cross, looking at a man with a simian form lurking behind him—sets the stage for the contents. In this book, which works for thoughtful readers ages eleven to eighteen, Heiligman focuses on something unexplored in most Darwin biographies: Darwin as a man and what his personal life was like during the period when he set forth his controversial ideas. The book begins brilliantly—Darwin is conducting a scientific study, “To Marry or Nor Marry,” and listing the pros and cons of the idea. At the end of this exercise, he decides that “To Marry” seems the best idea. Charles’s choice of wife, his cousin Emma Wedgewood, will be one of his best decisions. Although they do not know each other well until they get engaged, Emma provides just the right balance for Charles. A caretaker and intelligent first critic of his work, she supports him in every way—and raises their large family while Charles works on scientific theory. At the beginning of the courtship, however, Emma has one nagging concern: she is a devout Christian and she fears for Charles’s soul because of his religious doubts. Heiligman walks readers through the publication of On the Origin of the Species, and the furor created by the book. But the focus of Charles and Emma remains an internal drama—a portrait of the marriage and family of Charles Darwin. Hence, readers see Charles Darwin much as Emma might have viewed him, a loving husband and father, a caring human being who truly did not want to upset his wife because of his scientific writings. Heiligman herself majored in religious studies; her husband is a science writer. Hence she understands on a personal level the issues she explores in this book. To get a better sense of Emma, Heiligman read her letters and makes Emma just as much a part of the saga as her more famous husband. Charles and Emma can be enjoyed by adults just as much as young adults. Come for the science—stay for the romance. This book provides both in equal measure. When Emma and Charles walked out of the library and back into the hubbub of the family gathering, they both looked dismal. The elderly aunts who were visiting took one look at them and came to the conclusion that Charles had proposed and Emma had refused. No one else in the house seemed to suspect anything at all, and Emma went on with her regular Sunday schedule. She went to the village Sunday school to teach. She had continued teaching there, even with Fanny gone; it was a part of her attempt to live more like Fanny had, more religiously. She had even written her own children’s stories to use in the classes. Originally posted February 12, 2011. Updated for . Oh wow. It’s really wonderful that this book is out there. I didn’t get a full lesson on Darwin until college although Darwinism was taught in high school, not in Biology but in our AP World History class. Wasn’t Darwin, in general, fairly wrapped up in his work? I seem to remember a quote from Bryson (I think) about him missing important family events while he was working. Suppose that adds conflict to the book. This book will give you a completely different vision of Darwin than anything else you have read. I’m sure you will enjoy it. Definitely a unique perspective on Darwin for young teens through adults — and just as you mention Anita, the science and romance are completely entwined, which made this book particularly compelling for me. I also appreciated that this book begins AFTER Darwin’s voyage on the HMS Beagle, because most narratives of Darwin begin with the Beagle. This only adds to the freshness of Heiligman’s book. I read it in one sitting — and it’s always exciting for me when this happens with non-fiction! I always feel compelled to step softly when near this topic. I live in a part of this country where the word “Darwin” can literally cause some people to start moving away from you, turn and leave. The two things I tell people about Charles Darwin, is first, to carefully and slowly read the first edition of On the Origin of Species..” and to think about what his research showed. Don’t let anyone tell you who Charles Darwin was, or what he actually said, go find out for yourself. And the material, is accessible to most readers. Darwin by all accounts was a kind, loving and ethical man. His love for Emma and his children was legend. When he said that telling what he saw in the evidence felt like confession a murder, he meant that. He felt in the end however that telling what he believed to be the truth, was the highest value he could offer to his wife, his family and humanity. And what a good thing for modern biology and medicine he did. The National Geographic film “Darwin’s Darkest Hour” will break you heart because it is a profound portrayal of the struggle Darwin went through, spiritually, emotionally and physically, just to simply stand up, and speak this thing. His foremost obstacle was his fear of hurting his wife since she was so devout. To me, this is the most genuinely romantic, and courageous story in science. I’ll be happy to read today’s selection. I’m a sucker for these kinds of stories! It makes me think Pride and Prejudice. It also makes me want to make this required reading for very fundamental southern baptist Sunday School below the Mason-Dixon. I love it when an author takes a controversial icon and makes them human to every reader!!! Darwin, outside of this book, is just the guy that continues to cause controversy. In the book, his love is devoted, sweet and superior!! Charles and Emma was fantastic nonfiction that reads as smoothly as some of my favorite novels. Heiligman skillfully inserts the science into the book without distracting from the main love story. I was not expecting to enjoy a biography of Darwin, but this book offers a new, enjoyable perspective on this famous scientist. I was shocked by how profoundly this book touched me – its such an unlikely love story. I’ve often struggled to define this book when recommending it to friends. What is it, exactly? It’s clearly well-researched, like every good nonfiction, but it has such a compelling narrative flow that it just might work as a romance. Or perhaps it really a philosophical tale, as it is as much about finding meaning than science. Whatever it is, I can’t say enough about it. I love this this book came out so close to “The Evolution of Calpurnia Tate” – they make interesting comparison points. I loved both “Charles and Emma” and Peter Sis’ “Tree of Life,” and I thought how interesting it is to see the same subject portrayed in such vastly different forms. I thought “Tree of Life” was absolutely beautiful in its illustrations and its imaginings of Darwin’s findings on his journeys, and I thought “Charles and Emma” provided such an interesting behind-the-scenes look of the man behind all that science and discovery. I would definitely recommend reading both books! I love this book, and I adore that Deborah Heiligman is married to Jonathan Weiner, author of The Beak of the Finch. I choose to imagine their relationship to be as challenging and satisfying as Charles’ and Emma’s was. This book is wonderful. I read it last semester for Susan Bloom’s nonfiction class. Charles is humanized in this book and by that I mean he’s very relatable. This looks like a fascinating read giving some new insights. I am already a big fan of Sis’ Tree of Life. Thanks, Anita! My mother was always a very intelligent and intellectually curious woman. As her ability to concentrate and read has diminished, I tried to find her books which would engage her. This is the last book she was able to read. I think it was worthy of that honor. Barb–what a touching comment,. It makes me love your mother! This really is a beautifully researched and written book. Thanks, Anita. I absolutely loved this book! As I was reading it, I frequently forgot that I was reading about real people and not just some fictional characters because it truly reads like a novel. I was really impressed with the amount of actual information this author was able to find from the time when Darwin and his wife lived. She made them feel like characters whose lives I could get into and understand, not just some stuffy historical figures. I am on a book review committee at the library where I work and I had chosen this book in November when our theme was “family”. It’s an excellent pick and even though I have not read many other biographies of Darwin, I feel like this one would still top the list. I had the good fortune of hearing Deborah Heiligman this past summer at the Simmons College “Love Letters” Symposium. She was a wonderful speaker and storyteller, and her enthusiasm for Darwin’s life and legacy shed light on the backstory and as well as her extensive research. This is a fascinating read and the portrait of an amazing historical couple. Great recommendation.